New in our program are the Wind Machines. Our Wind Machines will also be available with an additional burner, that works on propane gas. If you are looking for the most comfortable way to protect your crop, this is it! And if you want even more comfort, you can go for the Auto Start Option. Wind machines are ideal to protect larger orchards and fields. However, a good inversion layer is essential and the protected area will be more or less 5 to 6 hectares at a temperature of -3 °C. This however can be improved by installing an additional burner. Our wind machines can also be powered with the tractor’s PTO. 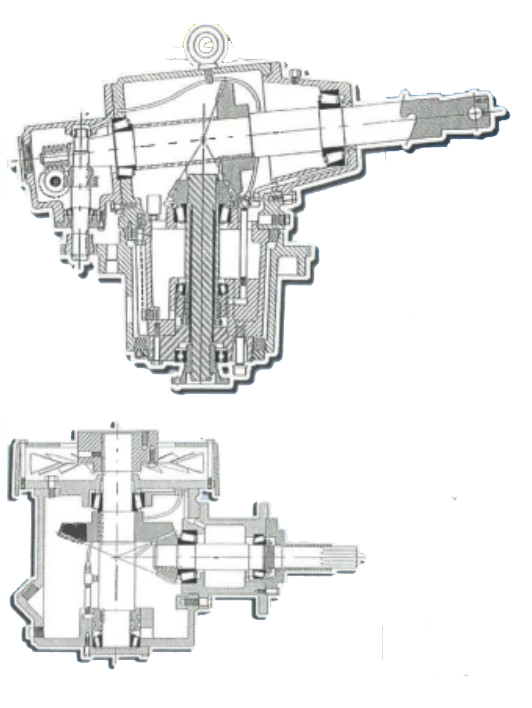 For this, we have a special gearbox available. Our engines are completely covered and insulated. there is only 1 burner that ejects hot air into the air at 1 point. This means that most of the time, the heated air is not in the center of the air stream of the fan. Therefore, more than 50 % of the energy is lost. So the efficiency is very poor. the burners run on diesel oil, so they are very environmentally unfriendly. The consumption is very high (up to 130 l/hour) so very expensive to run. Our new burner is much more efficient, it’s consumption is much lower and it runs on propane gas. Instead of using one big burner, we use separate smaller burner units that our placed around the tower. Propane burner, so environmentally friendly. The air is blown out by means of a powerful fan. You can install for each wind machine 1, 2, 3 or as many burners as you want. Each unit can be ignited separately, they can work sequentially depending on the rotation of the fan or all together; so the capacity can be adapted according to the outside temperature. Runs on liquid gas so no problems with the evaporation of the propane gas. Easy to transport and to install. You can program each burner to work only when it’s in front of the fan’s air stream. This results in a much better efficiency and it saves on fuel. 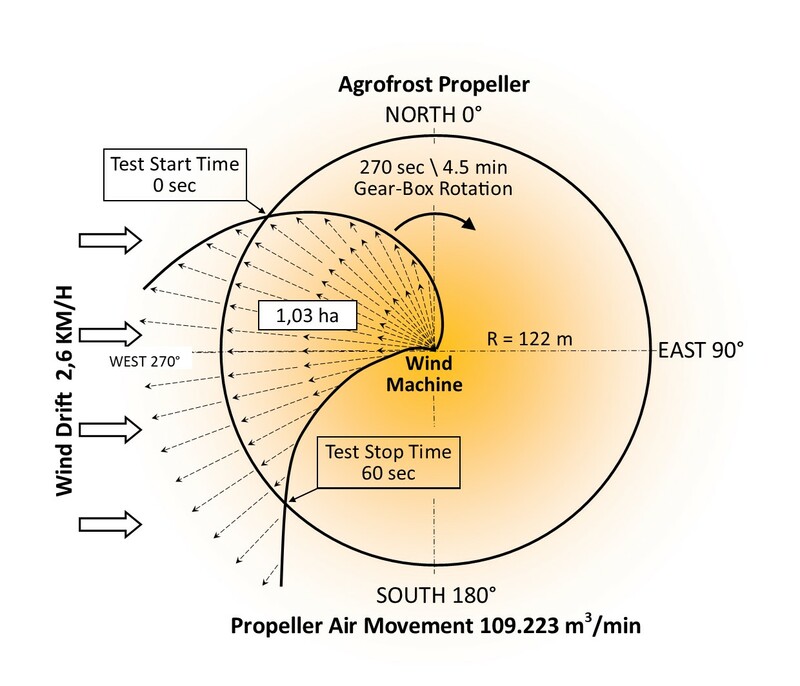 During a radiation frost, a wind machine is used to draw down the warmer air in the inversion layer and blow it into the orchard or vineyard. The wind machine needs to blow as much air as it can, to the greatest distance possible. During the day, the sun heats the earth’s surface. The soil and trees become warmer than the air in contact with them, thus heating the air. At night, the colder air settles next to the ground and the warmer air rises forming the inversion. The earth absorbs heat from the sun during the day and releases it into a colder atmosphere at night. The heat loss is greatest just before dawn and this is usually when the maximum danger of frosts and frost damage occurs. This release of heat creates an ‘inversion layer’ of warmer air which can be found from 10-15 metres above the ground. 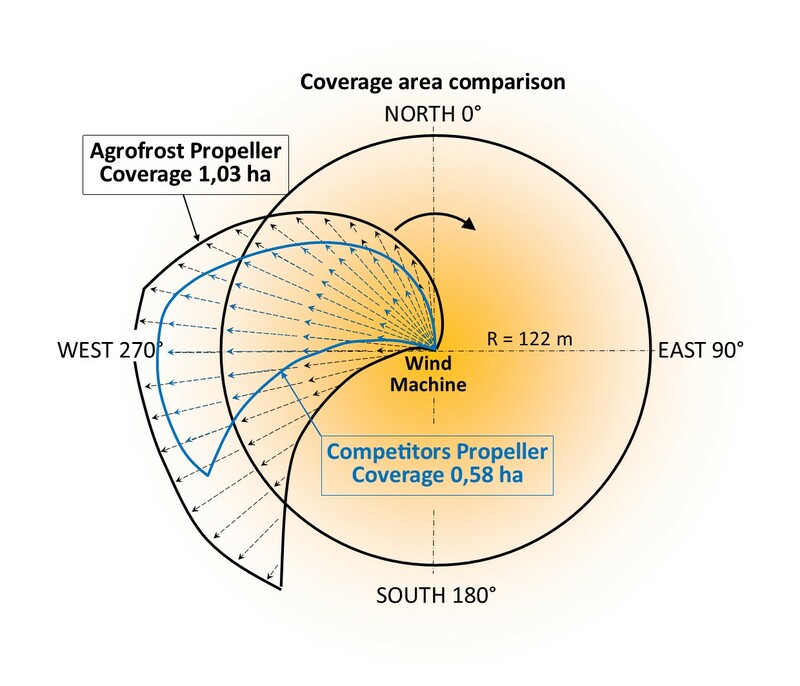 Wind machines use the warmer “inversion layer” air to protect a crop from frost damage. The wind machine is angled slightly downwards to pull this inversion layer down to ground level to protect the crop from frost damage. The removal of heavy cold air to prevent stratification and retard frost formation. Allow warmer inversion layer air in to replace the colder air at crop level. Some friction generated heat as the air moves past foliage to replace the ‘skin’ of colder ambient air. Fans are balanced in both length and width to eliminate vibration and provide a long life. The propeller is a one piece structural polyurethane foam core and fiberglass propeller. Most competitors have several components, of which 2 or 3 blades. This makes it impossible to align them perfectly. As a result, vibrations may occure, bearings brake down, welding joints rupture etc. Stiffer blade. Therefore no waste of horsepower. The useful airfoil of the blade is 20% longer than the competition. 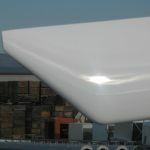 Dornier swept tips are used on the end of the fan to reduce drag and smooth out the air turbulence and vortices that builds up at the ends of the fan blade. This improves the air flow efficiency over the entire blade. There is a 60 second duration of air movement versus 35 seconds at the competitors. The volume of air produced is 2.2 times better than the competitors. Our propeller is hallowed, so much lighter. The weight is 2 to 3 times less than from the competition. Therefore, less horsepower needed, which saves on fuel. No need for a crane to set up the tower. Set up is much easier and safer. Because the tower can be put down for maintenance, there is no need for an expensive maintenance contract, because it’s easy to do it yourself. This takes the cost for maintenance down significantly. No ‘landscape’-pollution: this might be important to get a building permission. The tower can be set up and laid down electrically; this makes installation and maintenance much simpler and safer. No need to disconnect the drive lines when putting down the tower, unlike the competition. All models can be delivered with the Auto Start Option. This system automatically starts and stops the engine with the use of a remote temperature probe. Because it automatically shuts down the engine when the temperature is high enough, it saves on fuel. So the extra investment not only pays back in time, it certainly makes you sleep better. 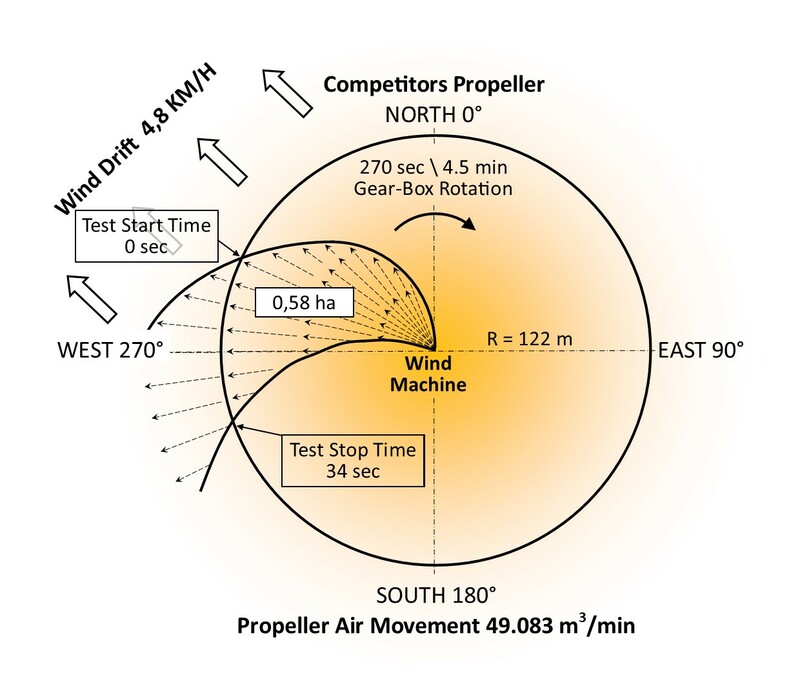 Central to the reliability of any wind machine is the gear box. Both top and bottom gear boxes are equipped with pressure lubricating. We use 100% Timken tapered roller bearings with a design life of 18.000 hours. This represents a load capacity of at least 10% greater than any current competitive gear drive. Our gear drives are built with spiral bevel gears of hardened alloy steel. 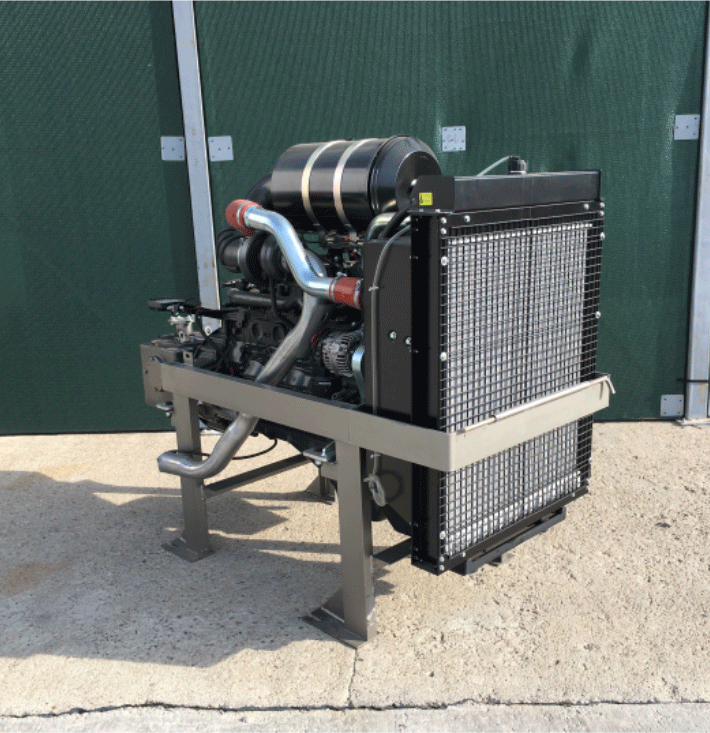 Because our gear drives are pressure lubricated and fan cooled, oil temperatures run at least 10 °C cooler, doubling the life of the lubrication oil. The size of the housing of a gear box is mostly not important: it’s the quality of the gear drives and bearings and the efficiency of the lubrication that determines the life span of the gear box. And the absence of vibrations. A big housing with a lot of ’empty space’ inside will result in more condensation, and because the gear boxes of windmachines do not operate a lot, condensation is the biggest enemy of these gear boxes. All our Wind Machines can be equipped with an additional burner. We use a 13″ centrifugal clutch, where our competitors use a 12″ clutch. Easy to maintain, and very low cost of ownership. Advanced features such as temperature triggered auto-start, runtime management and shutdown. 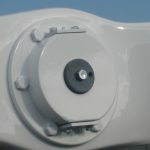 Balanced drive lines allow for minimal vibration in the transmission of power through the tower. Our drive lines exist of 3 pieces, not 2 and the crosses and yokes are 20 to 30% heavier. 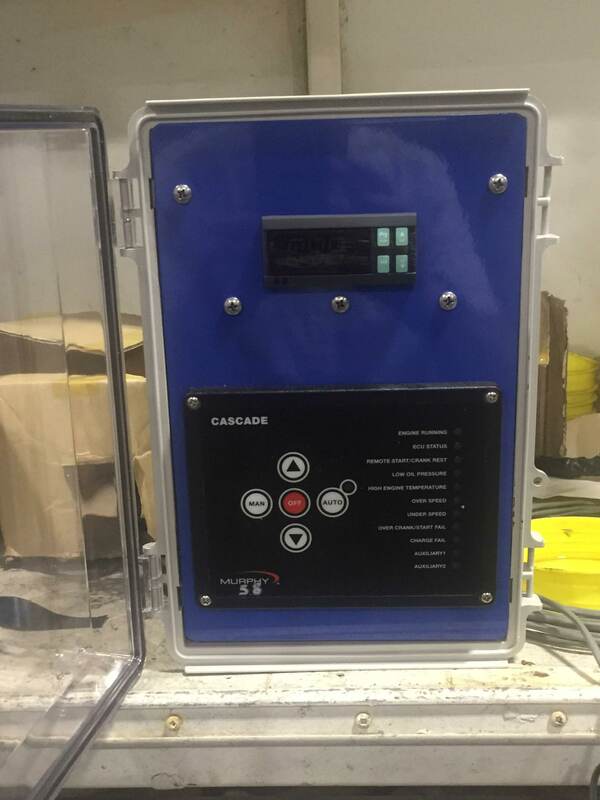 Our gear boxes are pressure lubricated. Possibility to mount an external burner to increase efficiency and capacity, especially when inversion is poor. 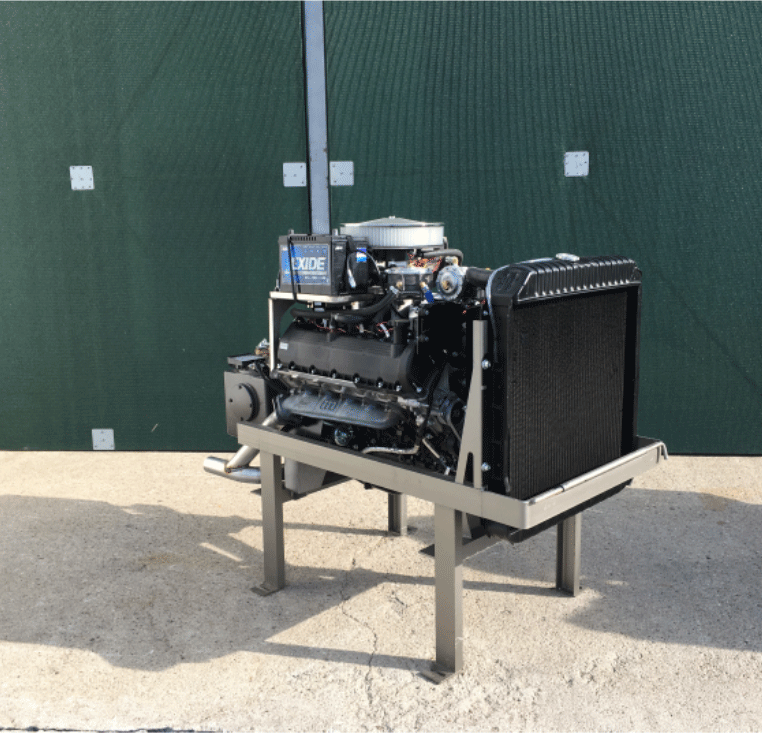 Depending on your requirements and preferences, Agrofrost wind machines are available with multiple horsepower outputs in propane or diesel. The tower and engine are put on a foundation, which is a concrete block with a size of 2m50 x 2m50 x 0m90. When you order a wind machine, we will supply you with a construction kit that has to be put into the concrete foundation. One piece construction Fiberglass wrapped over urethane foam core; high strength, low weight, increased rigidity. Hub Area Airfoil and air movement begins 35 cm from hub centre improving air performance. Low fan swing weight (47 kg), less friction, less horsepower consumed, less tower vibration, increased gearbox/drive train life. NACE 4409 airfoil, trailing edge wedge, swept tips - creates more air movement, reduces air resistance and improves fan efficiency. Reduce drag, smooth out air turbulence and the size of the vortices (air drag) - helps to improve air flow pattern and efficiency over the entire blade. Increases air velocity, produces wider sector angle coverage from 45° to 80°. Dynamic spin-balanced at 1400 RPM for smooth, vibration-free operation. 1000 RPM, slower speed for vibration-free operation and longer bearing life. Pressure lubrication allows for instant lubrication, pressurized oil sprays each gear and bearing dropping into a sump before recirculation, operating at temperatures 10 °C cooler. Less heat generated means more transmitted horsepower reaches the fan; most efficient gear drives available today. 100 % tapered roller bearing on drive shafts, 10% greater bearing load capacity. 18000 hours life span. Cooler running box doubles life of lubricating oil. Operates at 82 °C - 87 °C.